ESPN and Evolve Digital Cinema, a boutique digital creative agency based in Chicago, recently teamed up to tell the story of Norwegian Cross Country Runner Monika Korra. The TV short feature was a long undertaking and was filmed in Norway and Dallas TX, in several stages during the fall in 2011. Post Production began in December 2011 and was finished in Feb 2012. The story called for some very heavy subject matter. In short, Monika, a star cross country runner was recruited from Norway to come run for SMU. Once in the USA, she was attacked, abducted and gang-raped. After surviving the attack, instead of returning home, she decided to stay – help convict and eventually go face to face with her attackers. Monika went even further when she took her name and story public, in the efforts to help other victims and send a warning message to sexual predators. She’s currently writing a book and the ESPN feature is the exclusive first mini-doc to tell her survival story. The feature was shot on several digital cinema cameras; the Sony-F3, the Phantom V65 highspeed camera (recorded in 1080p CineForm), Canon 5D’s and Panasonic 2700 VariCam. Angenieux, Ziess and Canon EF L Glass was used. Post Production was done on Final Cut Pro 7 suites, VFX in Adobe After Effects with Sapphire, Text Tracking with Imagineer System’s mocha Pro and color design in DaVinci Ressolve and Red Giant Magic Bullet Looks. “The story was a really tough one to tackle, but what I think makes it different is that Monika really wanted to make an impact with this. She wanted to it to visually grab people and make them listen,” said ESPN producer Kory Kozak. Evolve Digital Cinema conceptualized a series of scenes to help tell her story in a new and different way – scenes where the viewer would get a peak into Monika’s nightmares and attack, scenes of alternate and mental realities and tracking text statements to iconify Monika’s thoughts, feelings and emotions. Enter mocha Pro. 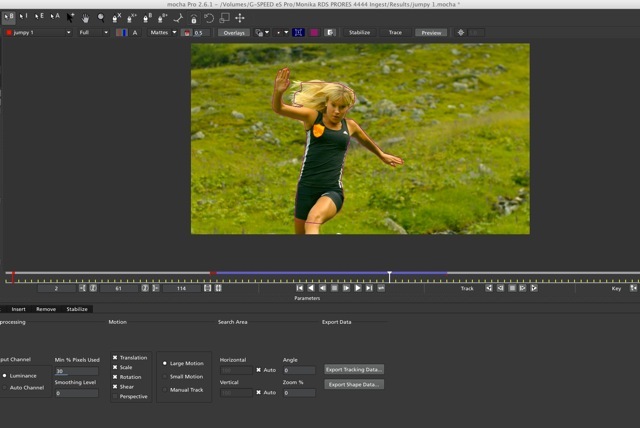 Evolve discovered mocha Pro from Imagineer Systems, an intelligent Planar Tracking utility for post production and VFX professionals that combines advanced roto, motion tracking, object removal, insert and stabilization features into a single desktop application. mocha Pro easily integrates with industry-popular editing, compositing, 3D animation and motion graphics applications so it makes for the perfect companion tool to just about any job you’re facing. “mocha Pro is just straight up awesome – the ease of use, the interface, easy integration to After Effects and Final Cut Pro, not to mention the huge library of free training and resources available on their web site. It’s really elevated our game and given us a huge new tool in the box,” added Jesse Edwards, Evolve IMG Director / Editor.